The Pickwick Club is one of the most fortunate inventions of Charles Dickens's fertile imagination. In the first pages of his first novel, Dickens devised a club whose members were "requested to forward, from time to time, authenticated accounts of their journeys and investigations, of their observations of character and manners, and of the whole of their adventures". 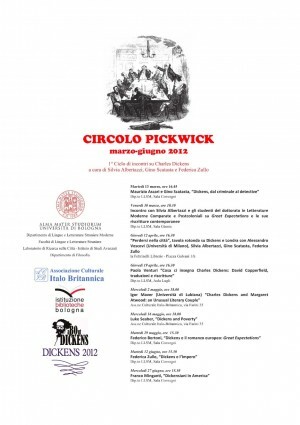 For the Dickens's Bicentenary, the Bologna branch of the Pickwick Club, with the help and support of Alma Mater Studiorum - University of Bologna, Associazione Culturale Italo Britannica and Istituzione Biblioteche, invited scholars and researchers to submit the authenticated accounts of their journeys, their investigations and their adventures in Dickens's world. In the third meeting Silvia Albertazzi, Gino Scatasta and Federica Zullo (University of Bologna) will talk with Alessandro Vescovi (University of Milan) about "Getting Lost in the City: Dickens and London".